It's a sunny afternoon when Claudia and I boarded the ICE (Inter City Express) train from the Black Forest town Freiburg, then switch trains at the Swiss Badische Bahnhof (SBB) and traveled via Olten in a Swiss regional train towards Luzern. The train sped past small hills, spurs, lakes, scores of tunnels and towns with church spires, Swiss cows and horses grazing on the lush green meadows. Inside the train were young men and women in trekking outfits, talking rather animatedly and laughing incessantly at their own jokes told in the Schwyzer dialect with a lot of guttural sounds and softly produced words with 'Ts.' If you know Schwyzer Deutsch, you've won the hearts of the Swiss people. I find it just wonderful to hear and reproduce the Schweizer sounds, especially the Basle dialect. A grey-haired obese lady was sitting with her husband near us. She was wearing spectacles and had a cloth bag in beige leather dangling in front of her legs with the words: 'Wir handeln f'r die Umwelt.' There was a pun on the word 'handeln,' which means 'we trade for the environment' or 'we do something about the environment.' The Swiss engage themselves a lot in humanitarian, cultural, environmental and money matters. We are surrounded by hummocky hills and then blue snow-capped mountains. There are Swiss farms in the foothills of the mountains. Miles of maize fields appear. The Swiss train is heading for Central Switzerland. We're approaching Luzern. An impressive grey castle fleets by and then you come across pompous mansions. An Appenzeller advertisement appears with the message: 'Seit 700 Jahre in Einklang mit der Natur,' which means that the Swiss cheese is in harmony with Mother Nature since seven hundred years. A well-dressed, curt train-conductor comes along the gangway with his ticket-puncher looks through his glasses and says, 'Richtig, gute Reise.' Something like 'Richt ho! Have a good journey.' We've left Luzern behind. You see myriads of Schreber gardens, which are small patches of gardens for city dwellers who want to flee from the smoggy cities and enjoy a bit of greenery, flowers and barbecues in the weekends. A lake algae-green water dashes past and hundreds of houses on the lakeside hillocks and spurs. That's quality of life for you. The hills in the outskirts of Luzern reminded me of those in Grindelwald, where you can ride up almost to the mountains Eiger, M'nch and Jungfrau in scarlet cable-cars. Suddenly a wonderful view of a lake and mountains appeared, with the Swiss autobahn below. An ugly landslide scar made its appearance. Aqua-ducts, bridges, hills, meadows, houses with the old traditional church of Arth-Goldau. A merry holiday whiff floated in the air. A sleek train from the S'dostbahn came by. Near the railway station was wood stacked for the winter. A crane, a lorry and cars sped by. The well-fed and obese Swiss youth in the train were having a jolly time. We went via Schwyz and took a bus to Morschach at an elevation of 800m, with mountains all around. It's evening and the sun is going down in the central Swiss Alps. You can see the snow on the summits and the ice-walls from the spacious balcony of the Swiss Holiday Park. There's a serene and tranquil atmosphere, and the air is so fresh in the Swiss Alps. That's landluft for you. 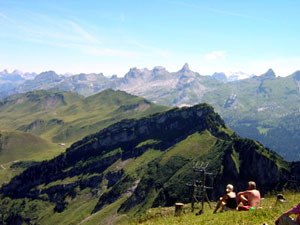 Morschach lies on a plateau at the foot of the 1922m peak called Fronalpstock with 900 souls, and its known for its Swiss Holiday Park and also Landal Parks. Morschach lies above the Lake of the Four Cantons (Vierwaldst'ttersee). A cable car brings you to the skiing area of Stoos-Fronalpstock, where you can also do a bit of trekking in spring, summer and autumn. The scenery of the Lake of the Four Cantons really took my breath away, even though I'm originally from the foothills of the Himalayas. After a sound sleep with an open window to let in the fresh alpine air, you are woken up by the ding-dongs of the Swiss cow-bells, as they are herded and walk languidly on their way to the higher meadows. As you look out of the window you see the black and white colored cows grazing in the green meadows above the Bauernhaus which is three-storied with white windows and dark brown wooden walls. The next morning it was refreshing to go to the local bakery run by Ms. M. Judd and her lovely Swiss girls. You could buy balance bread, Schnitzer, Kneipp and Ballenberg-bread in addition to croissants and small round buns. Digestion is excellent in Switzerland due to the cereals and high percentage of Ballaststoff(roughage) in the bread in addition to folic acid. After a hearty Swiss breakfast we went from Morschach (800m) to Stoos (1300m) and from there to the Fronalpstock (1922m), which is the highest viewpoint of the Stoos region. There is a relative easy panorama walk up to Fronalpstock but you can also use the cable-car and ski-lift to the top and can see the healthy cows grazing below you. They don't even bat an eyelid when the ski-lifts come near. They're used to visitors from all over the world. There's an excellent summit restaurant and naturally souvenir-shops. Last summer, one of the most beautiful ridge hiking trails in Switzerland underwent thorough reconstruction for the 150th anniversary of the hiking trails in the Canton Schwyz. He made a hand movement as though he was inhaling. 'Don't you have to take Budes, Salbutamol and Singular anymore?' I asked him. 'Nein, Gott sei Dank! Meine Lungen sind frei.' Thank God, my lungs are free now. From the summit of Fronalpstock you can not only see the Lake of the Four Cantons but also the village of Brunnen, where we went later to visit a dear friend Gertrude, who is a nun in retirement. Her home-peak (Hausberg) is the Mythen. An expression of cool exhilaration comes across as you peer at the Swiss landscape unfolding before your eyes. Nature manifests itself in every season in its characteristic way and all the four seasons have their own charms. The Spring in the mountains with its Crocus flower mantle and patches of snow covered meadows. The Summer with its magnificent and colorful alpine flora pristine in beautiful sunshine. The grey misty and rainy days, accompanied by thunder and lightning, landscapes after the torrential rains and Swiss houses under water and schlamm. Muddy everywhere. The Autumn with its brocade of diverse leaves in the trees and everywhere. Strewn wantonly by the wind in yellow, scarlet, light green and brown colors. And in the distance clear views of the mountains, valleys and spurs. Just as in Nepal's hills you hear the grass-cutting women singing their ghasi-geet (grass-songs) and a refrain or even a spontaneous reply comes from the other side of the hill, the people of the Alps fold their hands to a cup in front of their mouths and shout their prayers to the Gods in the Alps. It could be Jesus, Holy Mary or one of the many Saints. The prayers deal with the protection of the people, cows, Alpine-huts, meadows and they expect the blessings from God or Maria Hilf. When humans are confronted with the elements and Nature they have similar lines of thinking irrespective of their domiciles. In Hinduism and Buddhism for instance when a bhakal (Gel'bde) or promise to God has been made in exchange for a favor, then it is expected that the promise is held. My Mom had wished a son and had prayed to Shiva, Sita and Mahakal and had promised to go on a pilgrimage if her wish came true. She got her son and complied by undertaking a pilgrim's journey to Darjeeling's Mahakal temple, Kathmandu's Pashupatinath temple, Jagannath Puri, Hardwar and Sita's temple in Janakpur. If she hadn't fulfilled her promises then she'd have remained an uneasy, restless soul for the rest of her life.